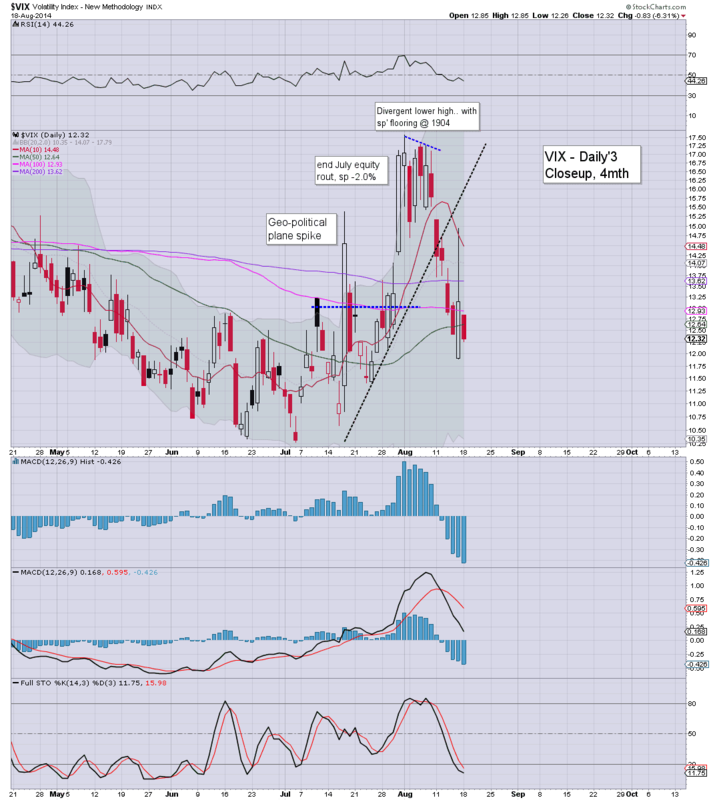 Having closed last Friday with moderate gains, the VIX started the week back on the slide.. settling -6.3% @ 12.32. Near term outlook is for the 11/10s... the only remaining issue is whether single digit VIX if sp'2000s. *the sixth net daily decline... from 7 days. VIX looks set to remain subdued for some weeks, the big 20 threshold looks unlikely to be surpassed no earlier than October. Daily MACD (blue bar histogram) cycle has not been this low since mid February... but it can easily remain at these low levels for some weeks. Best case for equity bears this week, a gap fill in the VIX 15s, but that probably only equates to sp' in the mid 1950s... where the 50 day MA is lurking. 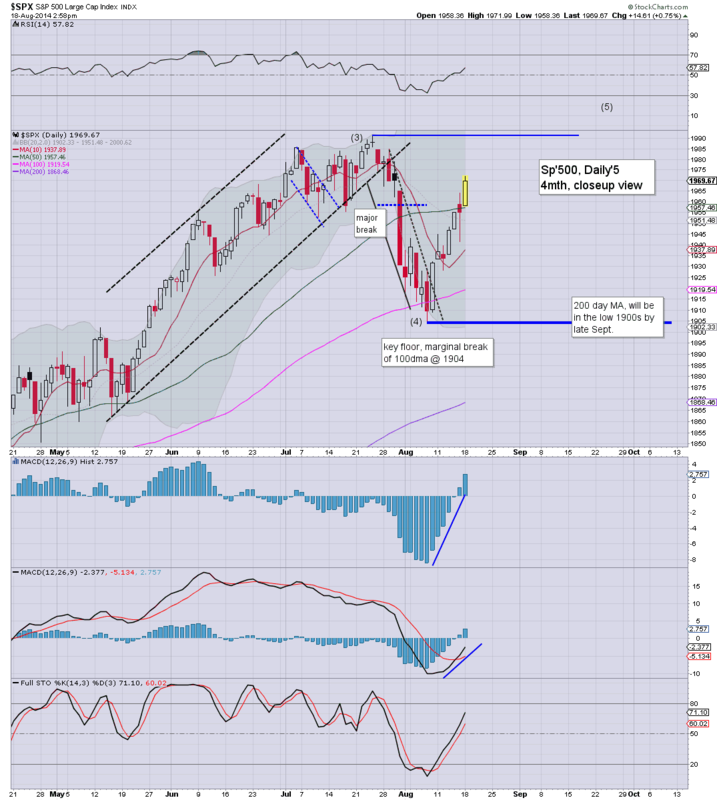 US indexes closed with significant gains, sp +16pts @ 1971. The two leaders - Trans/R2K, settled higher by 1.7% and 1.5% respectively. Near term outlook offers the 1980/90s, whilst 2000s seem likely on a second attempt... later this month. *I've largely 'cleansed' the hourly chart, right now, all I'm going to leave on there is a simple channel. So...day'1 of the week was strongly in favour of the bull maniacs. 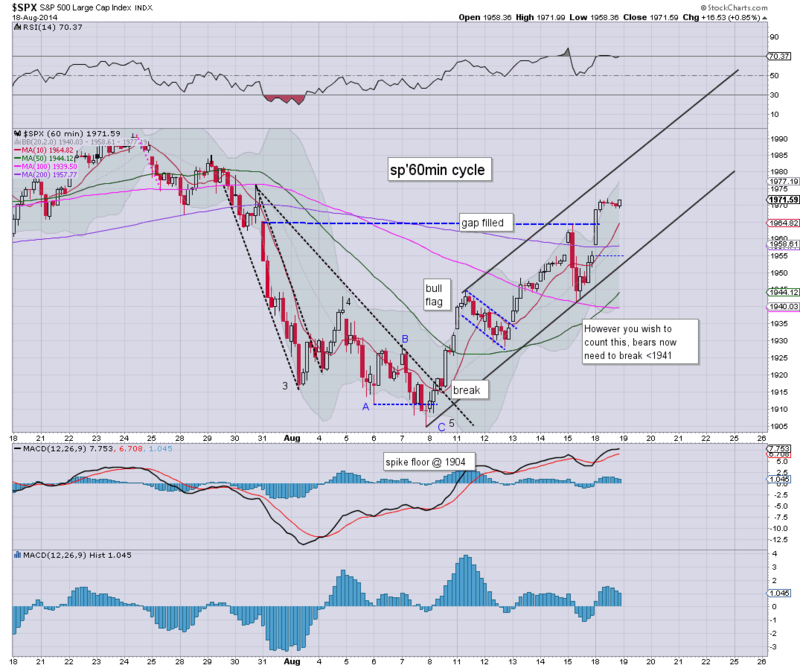 The weekly cycles are confirming the turn from Aug'7th... and we're headed higher. The brief drama from Friday morning is now a faded memory, and there is increasing consensus that we're headed into the sp'2000s. *despite missing on some further gains, I'm more than content on the sidelines.. and have ZERO interest in any short side trades until at least mid/late September. A somewhat tiresome day.. even though I didn't hit any buttons. *last Friday's target of sp'1930s with 15s was a viable target for today, but hell, it is overly risky to be on the short side..and as noted at the time, I sure wasn't going to attempt any such trade. 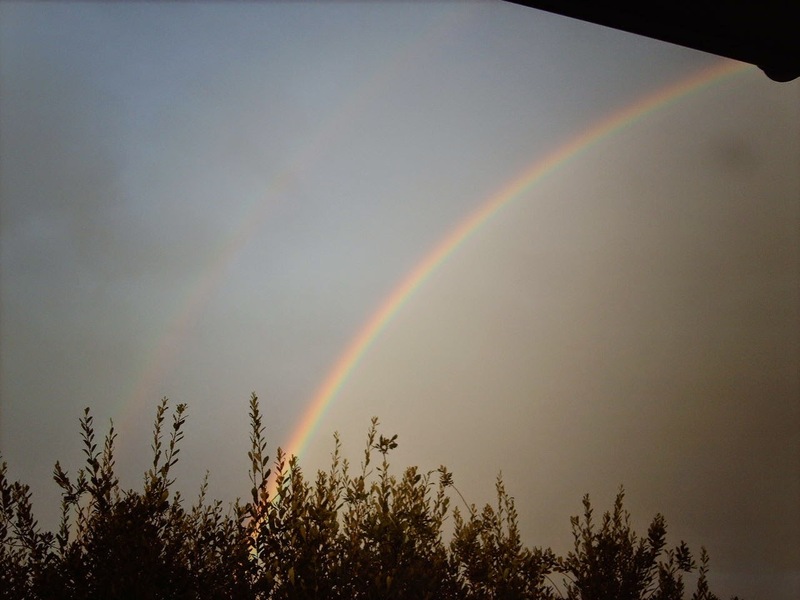 Meanwhile...outside..its rainbows in London city.... as the sunset is near. Well, daily trends are offering a few more days higher, whilst the more important weekly cycles are back to outright bullish - offering 3-5 weeks higher. 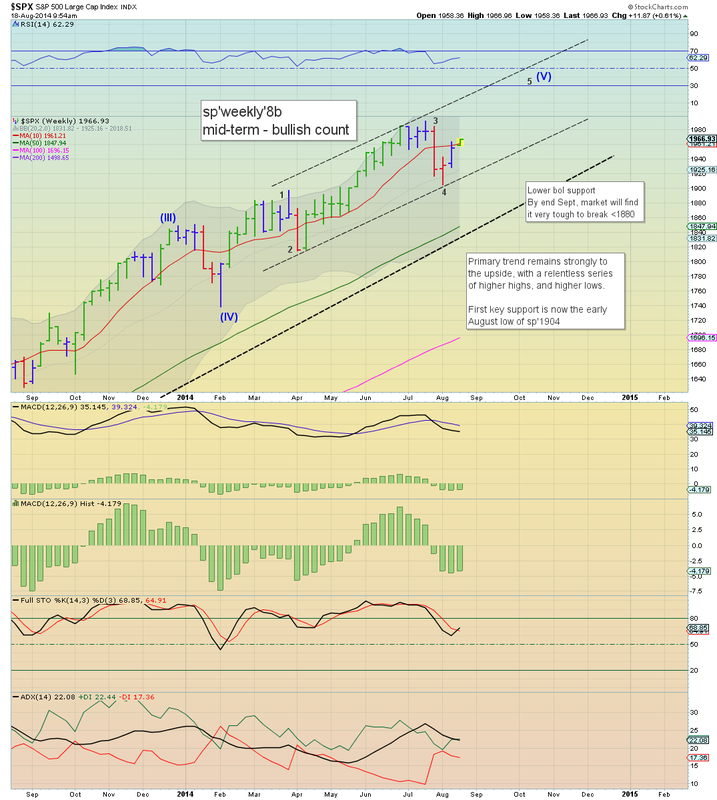 Monthly cycle remain bullish of course...with notable weakness in the Dow/R2K. It remains amusing to see so many get overly wrapped up in the minor noise. All that time and effort....completely wasted on such minor moves. 3.30pm... baby bull flag on the smaller 5/15min cycles.. although yes.. the hourly cycle is rolling over. As is almost always the case... overly risky to attempt to trade the smaller down waves. 3.47pm.. VIX in melt mode.. 11/10s likely... but more on that after the close. US indexes look strong, and are holding all of the morning gains, with sp'1970, and VIX -5% in the 12.40s. Metals remain weak, Gold -$7, whilst Oil is lower by a rather significant -1.4%. Strip away all the chart counts, support/resistance etc, ... the clear turn (aug'8) was with a rather clear blue candle. We've now 4 consecutive green candles on the daily chart. 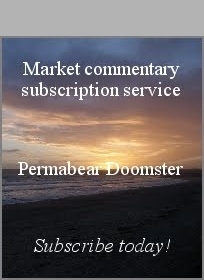 Market is outright bullish... with ZERO sign of this levelling out any time soon...2000s are viable in the immediate term.. but will more likely be hit on the a secondary attempt in late August/early Sept.
*I remain content on the sidelines... at least I'm not short. 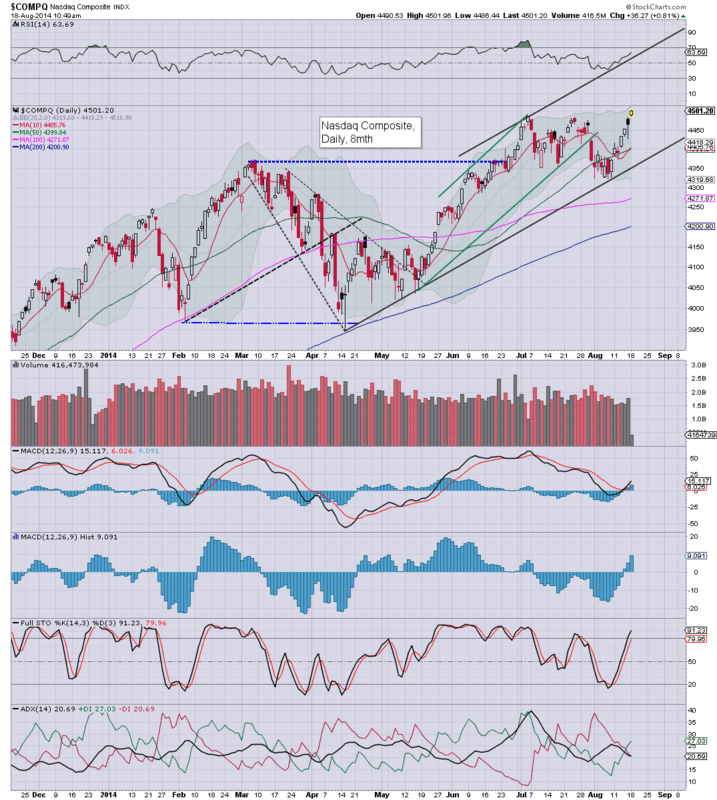 US indexes continues to climb, with significant gains for all indexes. 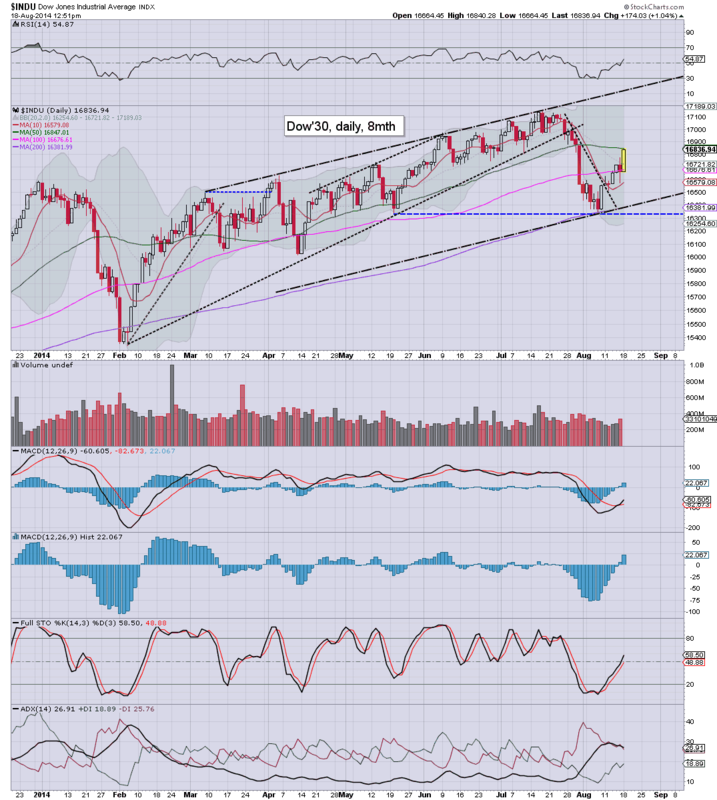 The Dow is making a play for a daily close above the 50 day MA of 16847. 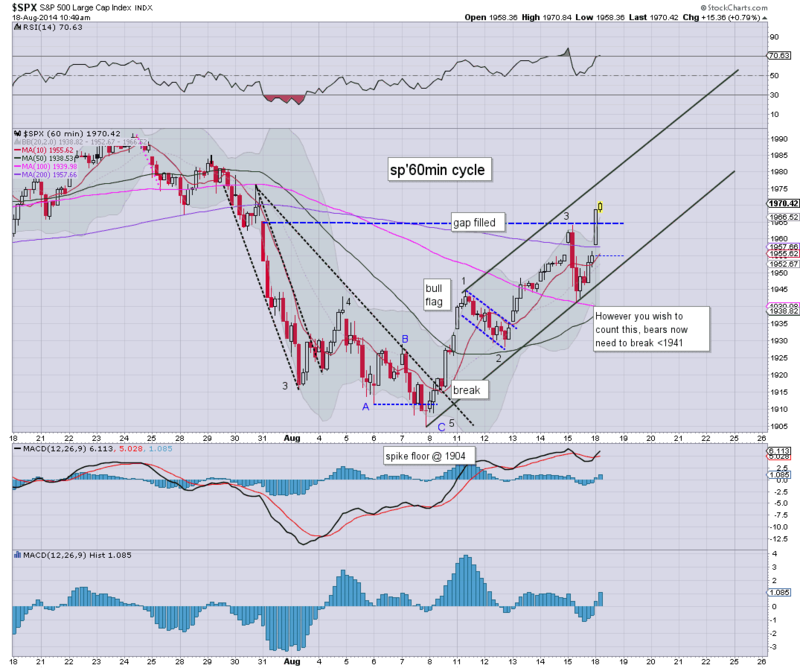 Daily, weekly, monthly cycles all offer 17200s in the immediate term. 17300/500 zone is viable in September. Last Friday morning's little washout is now looking a fair way lower. Daily charts offer a straight up run to test the historic highs.. and with the Nasdaq already breaking new post 2009 highs, there is little reason why the rest of the market won't follow. Oil remains very weak, -1.4%, but hey.. that is bullish US consumer, yes? Shippers looking fine.. DRYS +2% @ $3.27...seemingly headed for $4 in September. 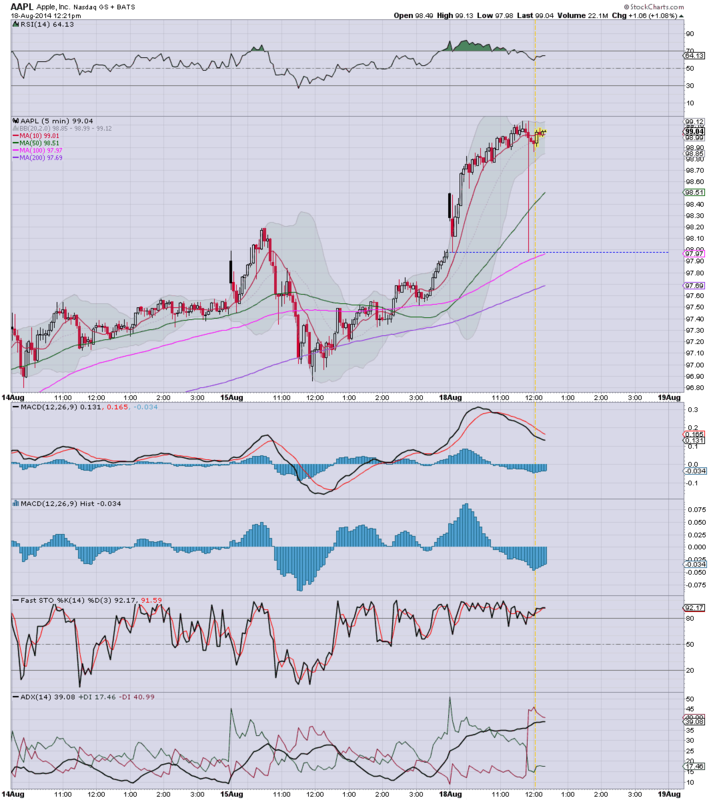 ...it won't take long to break the giant sp'2000 threshold. Whether this week, later in August.. or September, there seems zero point in attempting any shorts. Indeed, the only weakness is in the precious metals, Gold -$5, with Oil -1.4%. Whether you want to label everything since the sp'1904 low as a wave'1...or whatever... the trend is clearly UP. No doubt some will be getting overly excited on the next minor retrace..but then...what else is new? oh well, its still bullish, yes? 12.30pm.. R2K +1.5%.... Dow +171pts.... its starting to get pretty crazy bullish again. Increasing chatter on Oil...but from a 'bullish economy' perspective. *most notable today... Nasdaq Comp', new post 2009 highs. However you might wish to count this nonsense, the trend in the short..mid, and long term remains to the upside. I certainly continue to think we might see a key top in the 2030/50 zone..but that is likely another month away. *I am not in the mood to chase this higher.. and am content on the sidelines. US equities are building upon opening moderate gains, with a clear break of the Friday high of sp'1964. 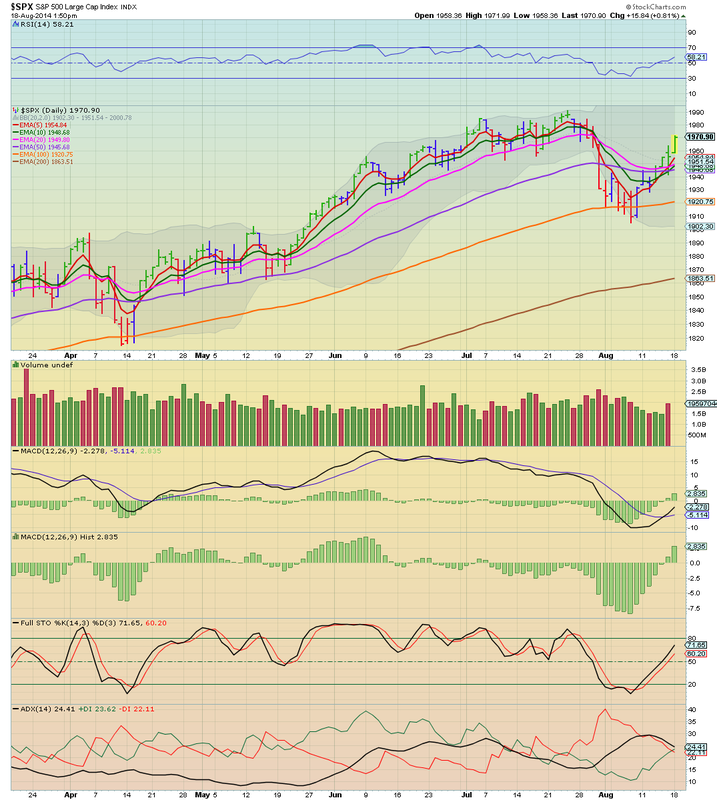 There is viable upside to sp'2000 in the immediate term. Metals are weak, Gold -$7. Oil is significantly lower, -1.1%. For the equity bears..this is just another typical lousy start to the week. 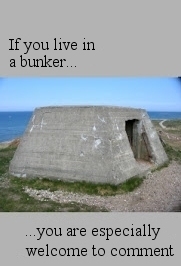 I don't expect 1941..never mind 1904 to be broken for some considerable time. The weekly 'rainbow' chart says it all....a green candle...following the blue 'turn' candle. Good morning. Futures are moderately higher, sp +11pts, we're set to start the week at 1966 - breaking the Friday high. Metals are weak, Gold -$3, whilst Oil is -0.4%. 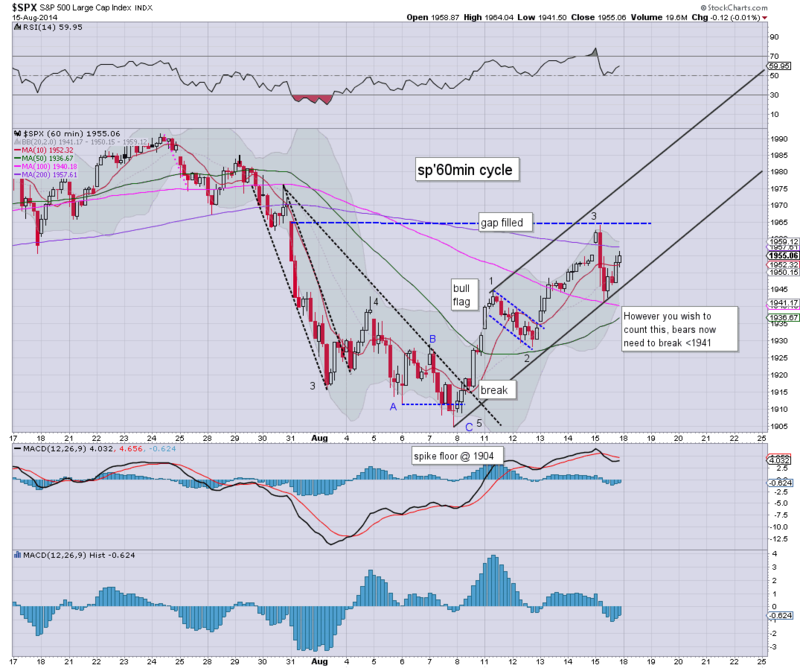 Equity bears face daily/weekly cycles that are both back to outright bullish. *with the break above the Friday morning high of 1964, I've already updated the hourly chart. What is clear...bears now need 1941..some 1.2% lower, and that does not look likely today. I was looking for a Monday decline to the 1930s - with VIX 15s, but that now looks out of range. I have little interest in chasing this market higher, and will be content to sit on the sidelines. For me, the only decent short side trade would be from the sp'2030/50 zone... and that would likely not be until mid/late September. I should note, I've little more than mild contempt for TF. He is still locked in the same mindset from 2010. 'Dollar doom'.. and 'metals to the moon'. Ironically, having called a floor in Silver from $49 all the way down to the teens, he then took his site private. That takes some guile, I'll give him that much. I'm not sure what I'd call him now. Perhaps 'still wrong' would suffice. Anyway, Hemke is great example of someone who is stuck in a mindset of denial...utterly unable to consider other alternatives. So much for the 'alternative financial media'. 8.53am.. reading around this morning... I still see everyone getting overly wrapped up in tiny moves. What about the broader trend? Many were getting overly hystrical last Friday morning, and now we're facing the 1970s as soon as today.. a mere 1% from historic highs. Sp'2000s sure will help to 'cleanse' the blogosphere of another wave of doomers.